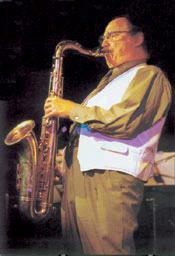 Frank Tiberi, a reed section all-star since 1969 and leader since 1987. Frank Tiberi studied clarinet at age 8; started playing professionally at 13; toured with Bob Chester, Benny Goodman, Urbie Green, played with Dizzy Gillespie, self taught on flute, (somewhere in between studied bassoon with the renowned Sol Schoenbach of the Philadelphia Orchestra) played as a doubler in many Broadway musical shows before settling into the illustrious "Four Brothers" sound (three tenors and baritone) reed section of the Woody Herman Band in 1969 where, he became a featured soloist, section leader, arranger, music director and ultimately leader of the Herman Band in 1987. FT's contributions include his brilliant arrangement of John Coltrane's Giant Steps and Countdown, which helped measurably to steer the band's reportorial direction with refreshment. Coincidentally, having been born in Camden, New Jersey, a bordering city of Philadelphia, which is the birthplace of, among other noted reedman, the late Charlie Ventura, Jimmy Heath, the late Stan Getz (a Herman alumnus) and Benny Golson; and the adopted home-town of the late John Coltrane. A quality bumper- crop from within virtually the same neighborhood. Tiberi has been associated with far too many great musicians to mention. The same is true of the credits due him, a partial list of which are: GIANT STEPS and THUNDERING HERD and is featured on both. He is also featured on the Herman albums, WOODY; WOODY BRAND NEW, RAVEN SPEAKS; LIVE AT MONTREUX; CHILDREN OF LIMA, (includes his bassoon solo); KING COBRA; 40th ANNIVERSARY; MAIN EVENT (Frank Sinatra); TOGETHER AGAIN (Flip Phillips); FEELING SO BLUE; ROAD FATHER; CHICK-DONALD-WALTER-WOODROW (Chick Corea Suite); LIVE AT CARNEGIE HALL (Teresa Brewer); LIVE AT MONTEREY (his own arrangement of Coltrane's Countdown); MY BUDDY (Rosemary Clooney); 50th ANNIVERSARY; WOODY'S GOLD STAR; WOODY HERMAN LEGACY; LIVE AT RONNY SCOTT'S (London England); COINCIDENCE ( Harold Danko, Tom Harrell Dream Street Records); and TIBERIAN MODE ( Solo Album with Joe Lovano, George Garzone and Andy Laverne), his epiphanies as a thrilling, imperious improviser and composer can now be better disclosed and shared. A devout scholar of Coltrane's harmonic development has totally internalized Coltrane's concepts of deceptive resolution, his thorough digestion of Coltrane fed into FT's conceptual development which also included assimilation from Charlie Parker’s way of restructuring/ reharmonizing tunes. Also, FT is like a guru of MVP stature among musicians, especially saxophonists - providing informal mentorship’s of lasting inspiration. Tiberi has been interested and active in music education since his early days with Herman, who said of him, "I thoroughly endorse his ability as a music educator as he so justifiably performed as a leading clinician throughout all of my scheduled seminars." Tiberi is presently on the woodwind faculty as an ASSOCIATE PROFESSOR at BERKLEE COLLEGE of MUSIC in Boston teaching improvisation to performance students and continues to direct the WOODY HERMAN ORCHESTRA. For information to purchase TIBERIAN MODE CD, contact Frank personally.